One of the new utilities is designed specifically for users new to the content preparation process. “We’ve encountered many potential customers that want to integrate projection and digital content into their productions but feel overwhelmed by the complexity of the process,” says Bill Hewlett, ImageCue CEO. 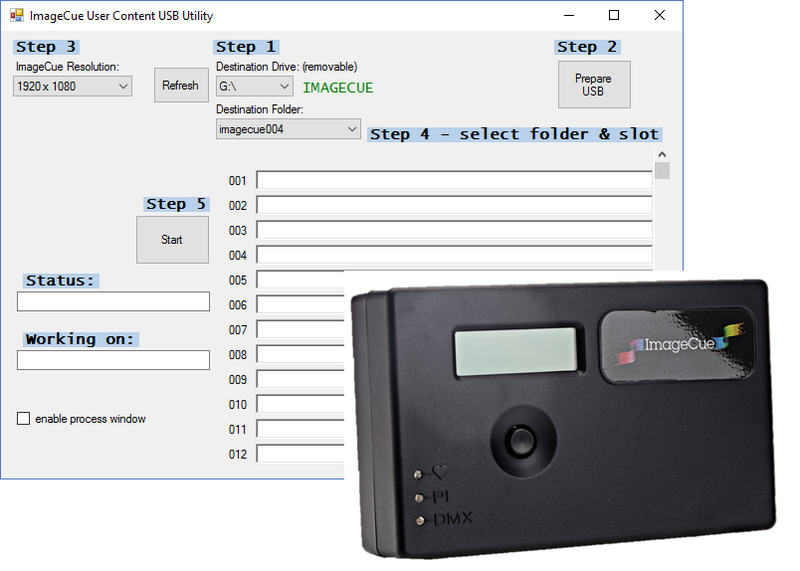 “This new utility allows the user to plug a USB flash drive into their PC and the utility steps them through the process.” The new utility prepares the USB drive for use with ImageCue and analyzes the user’s content, determining how best to convert or modify it for best performance with the ImageCue compact server. The tedious task of adding numeric prefixes to file names is handled by the utility. Another new utility in the suite will take a PowerPoint presentation in PDF format and convert it to individually numbered jpeg images ready for use with ImageCue. Like all of the other utilities in the suite, it prepares the content for use in one of the selected ImageCue output resolution settings. Rounding out the suite are utilities that convert commonly used graphic formats like bmp, gif, and tif to jpeg as well as a video conversion and extraction tool. Both of these utilities are available in a batch configuration that can process an entire folder of images or videos. An “auto-number” feature may be selected for batch processing. The utilities can now be downloaded from the ImageCue website. ImageCue hopes to make Mac versions of the utilities available in the near future.